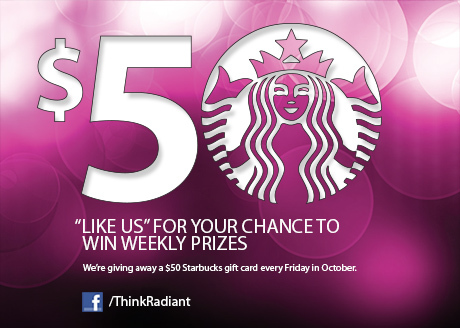 For the month of October, like us on Facebook for your chance to win a $50 Starbucks card. Every Friday for the next four weeks, we’ll randomly select one of our Facebook fans to receive the award. All you have to do is like us on Facebook and you’re automatically entered. Stay tuned for further contests in November!